Unfortunately, if you don’t have the ability to manage your time wisely, chances are you’ll never be productive online (which means, of course, no making big money, quitting your job, or working full-time in your underwear). 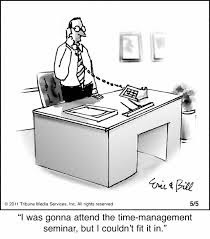 Time management is one skill you absolutely MUST master to be successful. Establish a “quitting time” – a hard, fast, carved-in-stone quitting time after which you PROMISE yourself you’re not gonna go back online for ANY reason related to work. Let’s say that you establish that time as 3:00 PM. About fifteen minutes before that time sit down in front of a pen and a yellow legal pad and make a numbered list of all the things you want to accomplish for the NEXT day. And never, EVER tell yourself, “Oh, yeah, I’ll remember to do THAT tomorrow; I don’t have to put it on my list.” Those are precisely the kinds of things you DO want on a written list because those are the things that are SO common sense that you either keep putting them off or you simply forget about ’em. Be sure to put that yellow legal pad in a convenient place – out of the way, but in a conspicuous place – beside your computer. Making a “To-Do” list on a word file that you can file in cyberspace is merely an exercise in self-deception; unless you put that list in an OBVIOUS place where you’re going to mentally “trip” over it all day long, you’re wasting your time. And take-your-time! Since this list is your Life’s Game-Plan for the next day, don’t just itemize what you MUST do; think about what you SHOULD do, what you COULD do, and what you’d LIKE to do. Finally – and probably most importantly – cross off each item (even the minor ones) as you accomplish them. This is key to the whole process because it gives one a subconscious feeling of accomplishment. One of the failings we ALL share is the inborn need to put off unpleasant tasks as long as possible. In other words we have that all-too-human habit of….. 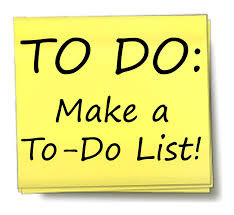 But there is a simple fix for this; When you’re making out that To Do list at the end of the day, pick out that ONE task that is most distasteful – that one task that you’d rather walk over hot coals than perform – that one task that makes your blood run cold! Now, the all-too-human method of handling this item is to put it off as long as possible, maybe even until it moves from being a mere annoyance to a major problem or catastrophe. But WE’RE gonna approach this just a little differently; you and I are going to do this “WORST, FIRST.” We are going to conquer that most repulsive task of all BEFORE ANY OTHER ITEM ON OUR LIST! You will find that when you consistently do the worst-first that you will be able to approach those OTHER tasks on your list with a relief and focus that would have been impossible if you had left that distasteful task weigh on your mind all day long. Obey “Posted Limits ” – It’s Important to Know When to Start, But It’s MORE Important to Know When to S-T-O-P! There are a lot of theories out there about how best to budget your time. The most popular is the “80/20 rule,” which states that since 80% of your business comes from 20% of your activities, you should then focus 80% of your time on those activities. Sounds great, right? Unfortunately, it’s really hard to stick to, and you’ll most likely find yourself going over budget on other things. And since any plan that’s hard to implement is essentially worthless, you need to find another tactic. A great way to do this is to assign time limits to each activity, and hold yourself to them. If you give yourself 30 minutes to respond to emails, once that timer goes off, you’re done. No ifs, ands, or buts about it. This will keep you on track with your day, and even better, having that sword hanging over your head really helps you focus on the task at hand. Chances are you’ll respond to more emails if you limit yourself to 30 minutes than you would if you gave yourself an entire afternoon. 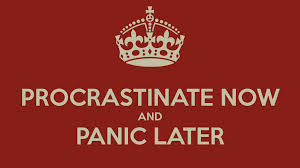 In my opinion that old Nike marketing quote – “Just DO It!” – is the most crucial in the study of time management. People fool themselves all the time into thinking that things are more important than they really are. Should that key word in your sentence be bolded or italicized? Better think about it…and next thing you know you’ve wasted a bunch of time on something that’s likely inconsequential. A far better strategy is to learn how to make decisions quickly. In the above example, just go with whatever your gut tells you, or even whichever’s easier. You can always go back and test to see if one truly is better than the other. Chances are, though, you’ll find most decisions are relatively meaningless, and so just picking one at random is preferable to wasting time debating their merits. I’m not saying make major decisions on the spur of the moment, without thought or planning. But how many major decisions do you really make in a day? I bet not many. There might be a lot that feel that way, but once you learn to just treat them like any other question, you’ll find that the decisions come easier…and that you get a lot more done each day. 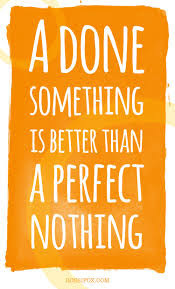 One of my worst traits is that I am a perfectionist! The sad part about it is that I know it’s a bad habit, a terrible habit, in fact. For example, I know fellow marketers who can sit down and write a well-crafted, effective sales letter in 10 or 15 minutes. But me? I might labor over a promotional message for hours. It’s not unusual for me to use a thesaurus to analyze if one word is more descriptive, more powerful, more “potent” than another word in delivering my message. To this day, like a recovering alcoholic or drug addict, I still struggle to overcome MY “addiction” whenever I start another project, no matter how large or small. But in the final analysis, I have found that it IS far better to be “done than perfect”; the end results are the same, but now….. …..I have much more time to look at cute kitty videos on the Internet! Click here to see a copy of Stan’s Secrets of the Big Dogs. Using this one dollar strategy you can increase your subscribers and PayPal customer’s list. How to make your first 1 dollar online fast? Consult, don’t sell in network marketing.